Making mistakes comes with all SharePoint implementations. However, learning from your own mistakes, and the ones others have made, is critical to ensuring successful adoption of the platform. Because we have helped so many organizations overcome their SharePoint challenges, we have put together a checklist of items that will help your team avoid common mistakes and take the necessary steps to get your users on-board. Having plans and processes in place is critical to SharePoint adoption and being able to make a case for ROI. Does your team know the answers to all of these questions in detail? What is our strategy and vision overall? How are we communicating changes and updates? Are we providing end users with help and micro-training content daily? How many support requests does our help desk get on a regular basis? What does our governance plan consist of? How are we measuring success of the platform? Has my team taken all of the necessary steps to be successful? 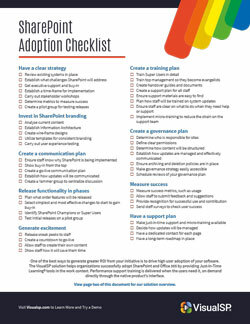 Download this SharePoint Adoption Checklist and guide to the VisualSP In-Context Help and Training solution today and get started today.